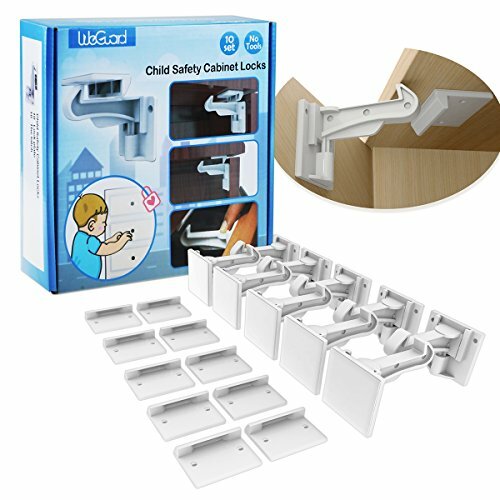 WeGuard 10 Pack child safety cabinet locks is new design to prevent cabinets, drawers form messing up by children and keep potential dangers away from curious babies. Powerful sticky sticker can against force up to 60 lb. Easy to install and use, after fixing it in the cabinet, push the button downward to open and close the cabinet. ✡ Easy to install, no tool needed. ✡ Easy to use, push the button downward to open and close the cabinet, drawer. ✡ Invisible design but visible safety, work with all kinds of cabinets, drawers, closets. PLEASE NOTE: Although WeGuard child safety cabinet locks are made of no-toxic material, it is not a toy. Please keep away from child. ☛ EASY TO INSTALL AND USE, NO MAGNET KEYS NEEDED: Tear out the sticker and install the baby-proofing cabinet locks in a second, push the button downward to open and close. Never worry about missing keys. ☛ 2018 NEW VERSION LARGER ADHESIVE BASE, AGAINST FORCE UP TO 60 LB: Child safety Cabinet Locks can be fixed in all kinds of cabinet, drawer, closet. Upgrade version with 10 locks, 10 buckles, fit with drawer with/without beam. ☛ INVISIBLE DESIGN KEEPS YOUR FURNITURE NEAT AND CLEAN: All cabinet locks will be installed in the cabinet and drawer, no unit will be exposed outside, as same as original. ☛ NOT ONLY KEEP POTENTIAL DANGERS AWAY FROM CHILD BUT ALSO PREVENT ITEMS FROM MESSING UP BY BABY AND PUPPY: Suitable for using around kitchen, bathroom,bedroom,living room, study and more. No more unexpected housework, you cabinet won't be a mess any more. If you have any questions about this product by WeGuard, contact us by completing and submitting the form below. If you are looking for a specif part number, please include it with your message.